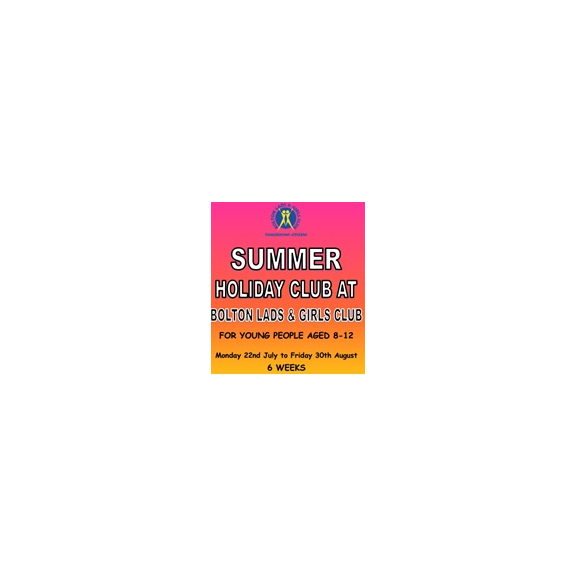 One of the biggest and most popular holiday clubs of the year is the Bolton Lads and Girls Club Holiday Club. Hundreds of 8-12 year olds use the club every school holidays, because of its absorbing activities and amazing staff. This year’s club runs between Monday 22nd July to Friday 30th August. In fact, the only day it is closed is Bank Holiday Monday on August 26th. If you book before that date though you will receive a discount on your booking fee, which will save you up to £12 for the whole week. Therefore before 21st July it is £5 a day for the 8am-6pm sessions and £3 a day for the 11am-6pm session. Bookings once the summer holidays have started are £8 a day for the 8am-6pm session and £6 a day for the 11am-6pm session. Children need to join BLGC at £3 before they can come to the club. The itinerary of the holiday club can change depending on weather and other factors, but in general children can enjoy indoor and outdoor climbing, canoeing, quizzes, drama, quizzes and kayaking at various points in the calendar year. Kids can eat at the club from £1 a time or bring a packed lunch. New to the club this year is the chef found on site, who serves up healthy meals for everyone who goes to the club. Youngsters can enjoy the lunch menu every day between 12 and 1pm. All the meat is halal and is freshly cut. That, and all the other ingredients, is locally soured and produced. Homemade dessert only costs £1 and so does the main course. There will be a selection of jacket potatoes, homemade sandwiches and vegetables for mains. To accompany the meal will be homemade cakes and scones for only 50p. Please see the image below for the full menu. For more information on any aspect of club life, telephoneBLGC on 01204 540100. It is one of Bolton’s biggest charities and regularly provides support and leisure activities for 8-21 year olds across the town.